Nah-neh? Nayn? How do you pronounce Nane Press, and where does the name come from? Nane Press is named after my mom, Elaine. ‘Nane’ (rhymes with rain) is her nickname. I always thought the pronunciation was super straightforward, but each person seems to pronounce it a different way. I do like when people say ‘Nah-neh’ though—it sounds very French and sophisticated! 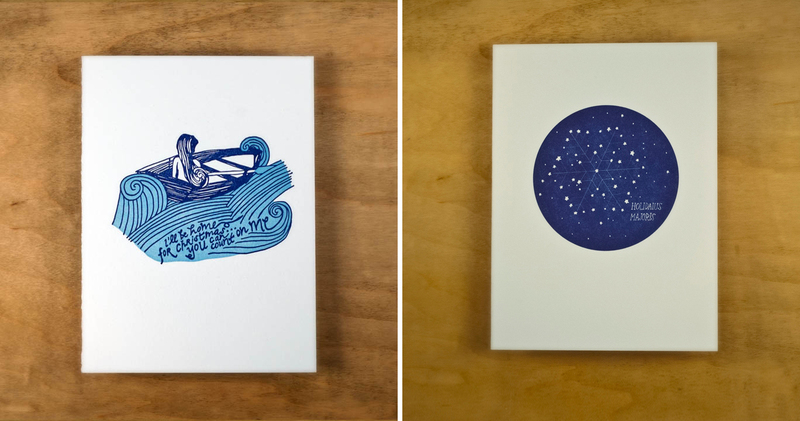 How did you get your start in letterpress printing? I’m trained as a graphic designer but took some printmaking classes in college, so it was always something at the back of my mind. About 6 years ago, I took an Intro to Letterpress Printing class at the Center for Book Arts here in New York City, and never looked back. I love letterpress printing because it links the design and craft worlds; being able to actually have the skills to bring to life something you’ve designed is an amazing thing. Where do you get inspiration for your designs? Since my life is so crazy and busy, I really romanticize and champion the small, quiet moments at home. Making the perfect cup of coffee, baking cookies, stargazing. I also like to incorporate hand-lettering and line illustration; there’s something beautiful in marrying a hand-drawn design with a hand-printed piece. Could you explain a bit how the letterpress process works? In short, letterpress printing is a type of relief printing. Moveable type or a digital plate is locked in place, ink is rolled onto the type, then paper is pressed onto the type, creating that lovely impression everyone is enamored with. But just as simple as it sounds, the process has all sorts of limitations. For example, big floods of color are very challenging to print, or a light ink on a dark paper. The challenge for the printer is to plan the job well, or have the patience to work around these limitations to get the best final result. Sometimes jobs need to be run through twice to get a good ink density, and often times setting up the job takes longer than to actually print it. Everyone loves a good letterpress item—as my boss says, you could letterpress a picture of dog poo, and it would still look pretty. Why do you think this medium has such an appeal? Most ways we communicate today have what I like to call ‘raccoon syndrome’: everything is shiny! iPhones, computers, and TVs are backlit; magazines arrive on coated, glossy paper. For the most part, letterpress printing is decidedly NOT that. The first thing someone does with a letterpress printed piece is run their hands over it; it’s tactile, made with purpose, and you can literally feel the mark of the maker. Check out more of Jennie’s work on the Nane Press website and purchase some lovely prints and card from her Etsy store.